It's not a birthday without a little music, yeah? Capcom Japan announced that they will hold a Rockman 30th anniversary concert at Nakano ZERO Dai Hall in Tokyo on July 8th. 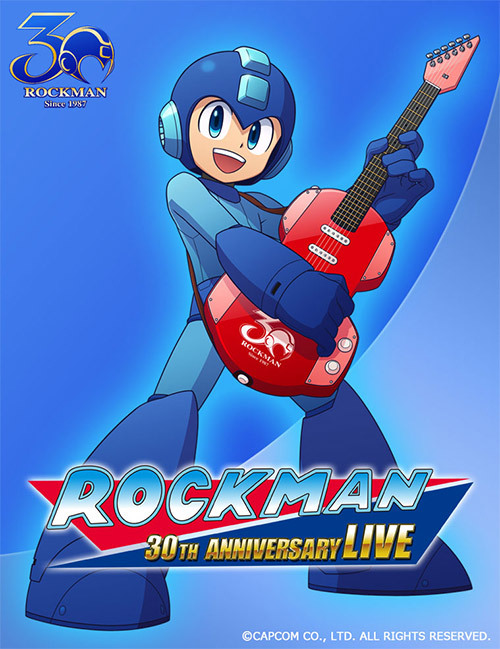 The concert will feature music from *every* Rockman series: classic, X, DASH, etc. The music will be composed by Noriyuki Iwadare, who is perhaps best known for his work on Ace Attorney, Grandia, Lunar, and Langrisser. Iwadare also had a hand in Rockman X7's score and the Air Man stage arrangement featured in Super Smash Bros. for 3DS/Wii U. The 30th anniversary band will also include Miyazaki Daisuke (guitar), Enomoto Atsushi (bass), Kaimura Noriyuki (keyboard), Yamauchi Yu (drums) and MOS (various). Lastly, the concert will feature a special Rockman panel where new information and announcements will be presented. Various goods and merchandise will be on hand for attendees as well. Pre sale tickets start on April 22nd at 7,500 yen. Ticket sale information can be found here. Oh my. That's gonna be one fantastic show! Noriyuki Iwadare is probably my favorite composer, as his work in the Grandia series was very influential and life-changing for me, as silly as that may sound lol. Can't wait to see and hear what's in store! A shame Grandia is a dead series, because I'd love to hear him compose for another entry. Nice event. I'm going to japan, but after that date, so i would not be able to see it live. You can never go wrong with Iwadare's work. His Lunar and Grandia battle themes are outstanding compositions alone. Once again Japan gets the cool Mega Man stuff. We should be getting this too. Americans love Mega Man just as much as,maybe even more than,Japan. C'Mon,Where the Hell are the American 30th Annaversary goodies? lol thats some bad timing, delay it a day? As i posted above, i'm going to japan, but after that day. I barely noticed it was the new Mega Man design, that's how you know it's good. After the lackluster experience that was the Capcom Cafe's rockman themed food. lol.. This should more than make up for it. Should be awesome! Yeah you don't know what you are talking about, Battle Network has great tunes to the fullest extent, so does Star Force. Mega Man ZX ESPECIALLY Zero house some of the greatest music the franchise has to offer, they just aren't popular (as series) so people don't think they have music as "memorable" or "iconic" cause some nerd videos aren't blasting some remix and gushing about them every 25 seconds to "remind" people. Mega Man Legends music is kinda lame though I can't put up a front about that one. nice, thanks for the heads up, I live in Nakano, 5 minutes walking from my apartment.